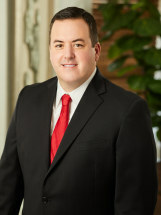 Chad W. Reed, Esquire, is the managing partner of Livens and Reed, PLLC. He grew up in Granbury, Texas, and received his bachelor’s degree of business administration from Texas Tech University. After graduating from Texas Tech, Chad joined Livens & Reed, PLLC and assisted clients with the preparation of their individual, estate, and trust tax returns for the first eight years of his career. He obtained his Series 7, Series 65, and insurance licenses to allow him the ability to help his tax clients with financial planning. Chad graduated from Texas A&M School of Law with a Juris Doctor Degree. He rose to the rank of partner at Livens & Reed, PLLC quickly after helping the firm become one of the largest Medicaid planning firms in Texas. Chad has been accredited by the Veteran’s Administration to give legal advice regarding Veterans benefits. Chad’s primary areas of focus include estate planning, probate, Medicaid and Veteran benefits qualification, formation of business entities, and agricultural law. He has the unique advantage of experience in the financial, tax, and legal arenas, which makes him well qualified to evaluate and develop estate, retirement, and asset protection plans. He can regularly be found speaking to the community on long-term care, Medicaid and VA planning, educating both the general-public and healthcare professionals. Chad believes that every client should be treated like his own family. Chad met his wife Lindsey at Texas Tech University. They are the proud parents/owners of their dogs Jewels, Belle, Ava and Kate. In his time away from the office, you will often find him at his farm in North Central Kansas, where they grow corn, milo, wheat and soybeans. Chad and Lindsey are avid hunters and enjoy experiencing the great outdoors.